The teenage batsman Kane Williamson is line for a potential Test debut after being named in New Zealand's squad for the second Test against Australia starting in Hamilton on Saturday. 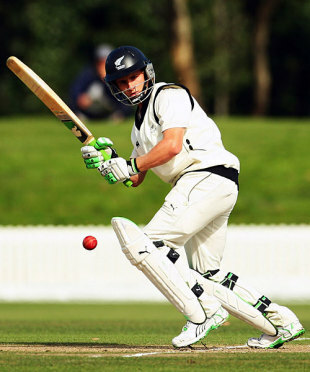 Williamson, 19, has been in irresistible form in the Plunket Shield this summer, and will replace the injured Daryl Tuffey. Allrounder James Franklin has also been included in the squad. Williamson, a top-order batsman and offspinner, put in a brilliant all-round performance for Northern Districts against Auckland last week, when he made 192 and finished with match figures of 5 for 59. He has made 588 runs at 53.45 in the Plunket Shield this season and will be pushing for a Test debut at his home ground, Seddon Park, after the shaky efforts of the top order in Wellington. "I wasn't expecting a call at all, but I was aware that I was probably getting looked at after past performances, I was absolutely thrilled," Williamson said. "I had a bit of contact with [coach] Mark Greatbatch, not on a consistent basis, but once or twice he said 'keep going'. I'm certainly excited to test myself at the next level and learn a lot." Franklin's ability to bowl left-arm seam won him the nod, as the selectors prepared for the possibility of overcast conditions in Hamilton. "There has been a lot of rain in Hamilton of late, and it is fair to say that the conditions we saw today at Seddon Park, at this stage, are far different to those we experienced earlier in the season," Greatbatch said. "We thought it prudent to have all our bases covered, and James does that for us." The squad also includes Mathew Sinclair, who was included as top-order cover in the squad at the Basin Reserve but did not make the side. The offspinner Jeetan Patel will feature strongly in the selection discussions on a pitch expected to take some turn, but most of the interest in the lead-up will surround the young Williamson. "He's in the 13 so he's a chance, there's no doubt about that," Greatbatch said. "We'll have to look at the conditions at Seddon Park but he's playing well. We resisted the temptation to bring him in earlier but we've decided with one Test left, he's a young lad playing well, very talented and it's an opportunity for him to be involved in our environment. If he does make the starting 11 I'm sure he'll acquit himself well." New Zealand squad Tim McIntosh, BJ Watling, Mathew Sinclair, Peter Ingram, Ross Taylor, Martin Guptill, Kane Williamson, Daniel Vettori (capt), Brendon McCullum (wk), Tim Southee, Brent Arnel, Jeetan Patel, Chris Martin, James Franklin.